The construction of Luznava manor began in 1905. The building was projected by the owner of the manor Stanislav Kerbedz (1810–1899), a railway construction engineer of Polish origin, professor, member of the Academy of Sciences in St. Petersburg, who purchased this property in 1870 from Polish landlords of the village Laizani, the brothers Peter and Julius Dluzhnevsky. Stanislav Kerbedz married Mary, a daughter of the owner of Vilani manor, Vikenty Janovsky. The Kerbedz family had six children. The daughter of S. Kerbedz, Eugenia Kerbedz (1855 – 1946) became the heiress of Luznava manor. She implemented her father's project and in1911 completed the construction works of Luznava manor, which were delayed due to the revolution in 1905. The building is a very unusual example of romantic Art Nouveau built with an attempt to implement architecture and art tendencies of 20th century Europe. The manor was surrounded by more than a 20 ha large park with an outstanding diversity of trees and shrubs, uncountable variety of roses and phloxes, lovely park paths and seven picturesque ponds, in which fish were bred. 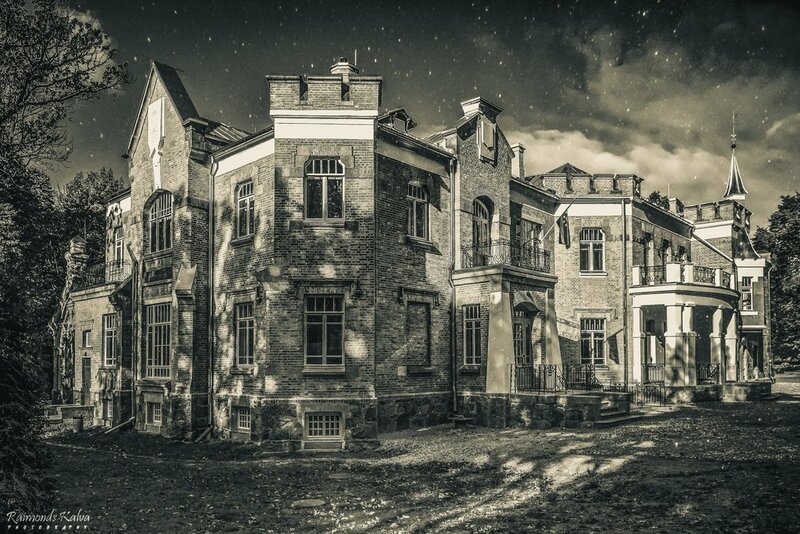 From 1911 until 1915, Luznava manor (at that time known as Dluzhnevsky manor) was a prominent cultural centre of Latgale. Famous as the summer residence of the Kerbedzs family and a place for art and rest where famous and new talented musicians, writers, artists and sculptors went to work and rest. The owners usually arrived in May and left in September for their constant place of residence in Italy. During the WWI, the owners were forced to leave their property and go to Italy, trusting the manor to its steward Ksendzopolsky. In 1915, the headquarters of the Imperial Russian army was situated in the manor house, partly destroying and damaging the luxuriant interior items and art works, but from 1917 until 1919, the Soviet Union authorities resided in the manor. From 1922 until 1944, Laizanu School for deaf-mute children was located in Luznava manor, the only such type of educational institution in Latgale. The building was adapted for the needs of the school– a central heating system was installed, large premises were divided into smaller rooms. During the WWII, from 1941 until 1945, Soviet and German army headquarters were located in turns at the manor. In 1945, Rezekne agricultural technical college was transferred from Rezekne to the manor. In 1946, Malta sovkhoz-technical college was established here on the base of the technical college and kolkhoz. The college was situated in the premises of the manor until 1993. In 1977, the building acquired the status of architecture monument of national importance. From 1993 until 1998, Luznava municipality administration was located in the building, in 1998, Luznava primary school was moved to the manor and functioned here until 2009, but afterwards Luznava municipality library remained in the manor. From 2011 until 2014, the reconstruction works and revival of Luznava manor took place. The author of the reconstruction project was an architect Inara Caunite, but Rezekne district municipality implemented the project.